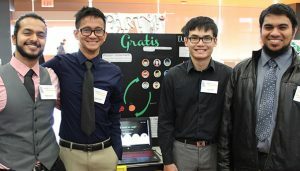 Raghav Gupta, left, a computer science student, poses for a photo with his teammates at the Silicon Valley Innovation Challenge poster judging. His team included Bala Nyan Kyaw, software engineering, Ian Lam, business administration with a concentration in MIS, Ijaaz Omer, computer engineering and Nhat Trinh, general engineering. Raghav Gupta, a software engineering student set to graduate in fall 2018, was eager to sign up for the Silicon Valley Innovation Challenge (SVIC) when he learned about it from several of his professors. He and a team of classmates already had an idea they had developed as semi-finalists for the Silicon Valley Business Proposal Competition and the Postcode Lottery Green Challenge, in Amsterdam. He and his partners thought about how to create a fast, inter-linked network between vendors who wish to give away excess food and hungry students looking for free food, which eventually became Gratis Food. As they developed their idea, they worked with professors and connected with Audrey Hague, a user experience research and industry expert. The team took first place for best overall innovation at the SVIC Final Showcase judging on November 29. “Along the way, we have met many other mentors in the field of student success and business, from whom we have learned tips and tricks to ensure the success of Gratis,” Gupta said. SVIC helped Gupta and his team learn how to market their product, but also how to market themselves and give a concise elevator pitch. They welcomed the feedback and input from judges at every step of the challenge, and have set milestones for Gratis’ future. The challenge is facilitated through the Lucas College and Graduate School of Business with students from many colleges participating. In its 14th year, the SVIC program allows students and alumni to work on interdisciplinary teams to develop a creative solution to a social or community issue. Laimin Lo, a lecturer in the College of Humanities and the Arts, has been the SVIC director for three years. She coordinates the program that partners students with industry professionals as mentors and draws in entrepreneurs to serve as judges through several rounds of evaluation. Participants must make it through an online judging session, a poster board presentation and finally an elevator pitch competition in the final round. Another unique concept included NewsBee, an application created by Matthew Quevedo, ’13 Political Science and a current graduate student in Urban and Regional Planning, and Andrew Demarest, ’15 Aerospace Engineering. Their product aims to change the way people view news by providing a localized map-based application that places news stories as pins so readers can view stories that are relevant to their neighborhood or city. The two took third place in the category of Best Overall Innovation. 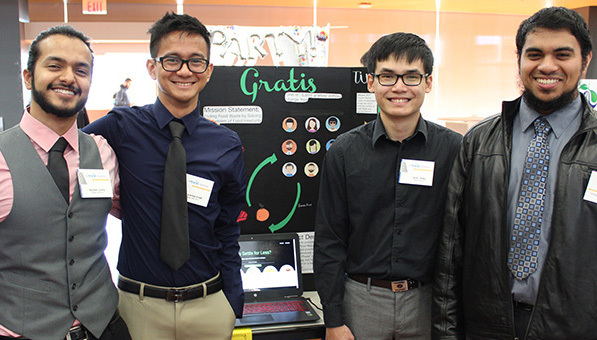 Fan Han, ’17 Computer Science, took first place in the Social Innovation category. He worked with Debra Caires who is the Computer Science coordinator and CS100W/CS200W Computer Science Director of the Internship Program for the College of Science. Their idea includes a technology called Upright Assist that helps people with mobility issues such as paraplegics, those who are wheelchair bound or the elderly to sit or stand independently. Engineering Management graduate student Neha Maynil was inspired to create a mobile application to increase intelligence in children and won first place for best educational innovation. She noted that SVIC helped her come out of her comfort zone, network with different people and improve her concept. Partners this year included San Jose Water Company, Intel, Startup Grind Powered by Google for Entrepreneurs, Tech Lab Innovation Center and The Indus Entrepreneurs. See the winners in all categories online.